Definitely Superior wishes to emphasize to the arts community-at-large an awareness of the diverse nature of artists and an appreciation of the contemporary arts in the region of Northwestern Ontario, by allowing access by members and collectives to develop shows and art production as well as a place to exhibit. 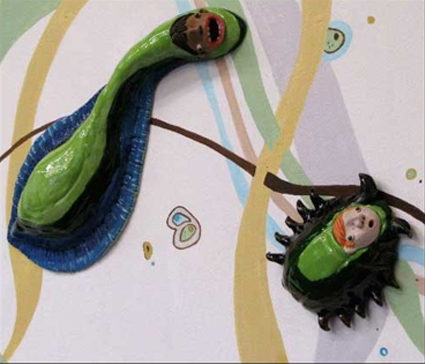 This month features Denise Smith [HBFA Lakehead University], in her first post-graduate solo exhibition comprising of an exciting new contemporary installation of ceramic based art works which takes a satirical examination of the differing scientific, cultural and religious beliefs surrounding the origin of our species. Denise says she uses kitsch as her weapon and irony as her ammunition. Smith is a well recognized artist in the region for her ceramic visual works; with high technical skill and cultural commentary, she engages viewers both visually and intellectually.